I recently read from github testings of orange pi lite2 testing that wireless is working. But I download from the official website of https://dl.armbian.com/orangepilite2/Debian_stretch_dev_nightly.7z(built 0824) and burn it, it starts, but the wireless is missing. I also read that the firmware added ap6255 wireless driver, so I download https://beta.armbian.com/pool/main/a/armbian-firmware-full/armbian-firmware-full_5.59.180915_all.deb and installed it. After reboot, the wireless is still missing. So the support of wireless is built-in or usb? Should I build armbian myself with the lastest code to support the built-in wireless? Thank you. Should I build armbian myself with the lastest code to support the built-in wireless? So when will the automate nightly build run? I think wireless support is a big improvement for orange pi lite2 version. It deserves a new build. Never, since it is not enabled for this board. There is no end-user support for boards/kernels that are still under development because it is too expensive. We barely manage to provide free support for stable builds. We make nightly images for developers and development purposes. Yeah, I know, it is a wip board. I do not intend to act as an end user, but a tester, only. Sent PR with correct parameters and image will be in the batch. and then request a pull request? Only CLI images. We don't need the desktop for now. Sorry for testing late, just back from vocation. The new nightly build is unable to get to the login step. and then a black screen with a cursor blinking, then after a long time, the login message showed. and then the hdmi screen lost signal. Seems that the simplefb node not found. Other debug messages missing, still waiting for my usb2ttl cable. Unbootable kernel with OPi One Plus confirmed, runs into panic, reading from UART. There is something wrong with the later 4.18.x kernel. 4.18.0-rc7 from @Icenowy sources working well. 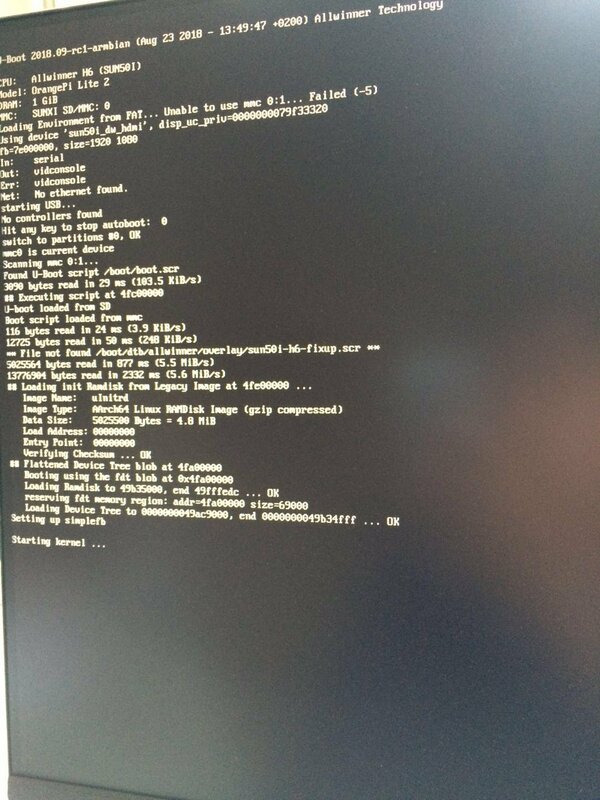 Unbootable kernel with OPi One Plus confirm﻿ed, runs into panic, reading from UART. There is something wrong with the later 4.18.x kernel. 4.18.0-rc7 from @Icenowy sources working well. I'll try to bring it up in 4.19.y ... some basic support is getting mainlined and it will be less troublesome. I hope. Since nightly builds are now available, what else do I need in order to enable ap6255 wireless? If the image boots, it should work out of the box. The ubuntu images boot, but wifi does not. First I tried the 0923 nighly, then upgraded to 0926 last night but wifi does not show up. I found nothing related to AP6255 nor Broadcom in dmesg. I will try the latest debian later today. The kernel is the same, just the OS on top is different. Which kernel are you using ? what are the timestamps of those kernel files in /boot ? Are they newer than Sept.7th ? Did you do the following "grep" on "dmesg" ? drwxr-xr-x  3 root root     4096 Sep 26 21:31 .
drwxr-xr-x 22 root root     4096 Sep 23 23:12 ..
That is really odd ! @Igor is this nightly has been built differently from the normal WIP DEV build process ? is this nightly has been built differently from the normal WIP DEV build process ? Possible. Let me check this during the day. We have a few problems here. First is that sunxi64-next branch was reverted back to 4.14.y since 4.18.y just not ready yet ... in 4.14.y there is no support for H6 ... 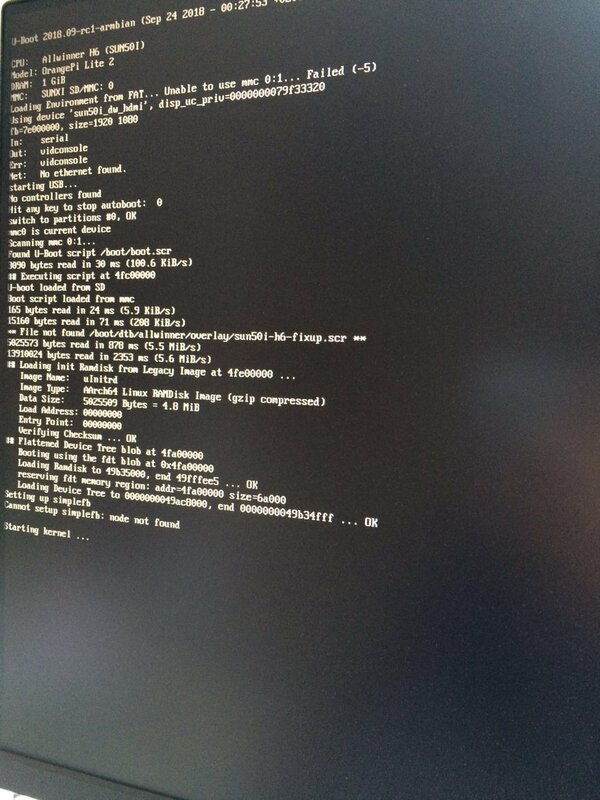 I can only switch to sunx64-dev, where the board boots, but without http://ix.io/1nK7 HDMI, WiFi and USB3 seem also not to function properly. Mmmmmm, I don't know why have to revert, but 4.18.0 rc7 works well except wifi. I am using an external USB3 - Gigabit Ethernet (ASIX AX88179 USB 3.0 Gigabit Ethernet) with no issues so far. Because that branch is temporarily development branch with a purpose to develop a few things. We only have two choices here - switch to current 4.18.y, say goodbye to HDMI for a while and fix other things, wifi perhaps ... or wait until HDMI is not mainlined. Other options are too expensive. I have to remind you that this board is under development and regressions are possible. Some are intended, some not. In my case, I can forego HDMI and would prefer the latest kernel instead. I don't know since I was using the current config with Icenowy's ugly branch. Someone needs to test this.